Unlike typical loan brokers, we don’t just collect your financial information and slap it up against a bunch of walls. We fully underwrite every loan request that comes in, and utilizing our extensive underwriting and credit experience, work to structure the deal on the front-end so it can get done in the market. Often times we go back to our customers and work with them to tweak financial statements or operations to turn what might have otherwise been a denial into a loan approval. We then send our detailed loan presentation out to our lenders for review. Based on the relationship we have with our lenders and our extensive experience having worked with them, we know which of our lending sources are most likely to make your loan. Often times to maintain customer confidentiality, we pull all identifying information out of the detailed memo we send to the lenders, and don’t provide them any of that information until we know the lender wants to move forward and the Borrower gives us the okay to send that information on. 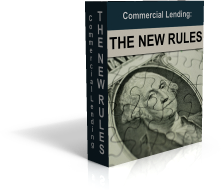 Having been lenders and credit underwriters in the past, we know what Banks are looking for, and our memos provide them with the details they need to make a quick initial decision on whether to pursue the loan or not. In fact, in multiple circumstances we have gotten approvals from lenders that previously denied our Borrowers loan requests when the Borrower originally applied to them for financing, primarily due to the fact they were not positioned right or in a format the lender could understand. Based on the relationship we have with our lenders and the volume of business we drive to them, we typically get responses on loan requests quickly and accurately, meaning our lenders don’t request a full financing package unless they have run the loan request up the food chain and are confident it is something they can get done. They don’t want to waste our time, and know we don’t want to waste yours. Unlike many lenders, we don’t disappear and just wait for a closing once a bank approval is in place. We stay involved through the whole process, assist you in working through issues and getting your paperwork together, and even will meet with appraisers, environmental engineers, and other inspectors to help move the process along. We will always take or return your phone call, keep you updated on the status of your loan request, and be there when you need advice and guidance. We are consultants here to serve you and work for your best interests. Lastly, we do not charge any up front fees, and work purely on a “Success Fee” basis, meaning we don’t get paid unless your loan closes. Furthermore, if you already have a lender or lenders you are already working with, you still have the ability to close with those lenders and owe us nothing in doing so. If we agree to do your transaction, we are so confident we will be able to get it done either quicker or with better terms than you can do it on your own, that if we don’t, we just ask in exchange for the name of your excellent lender. And if we get your loan approved and you don’t like the terms and don’t close, you owe us nothing. We don’t get paid until your loan closes. To complete an application today click here.